Helping in development of a less privileged school adopted by DPS Megacity - donation of furniture. 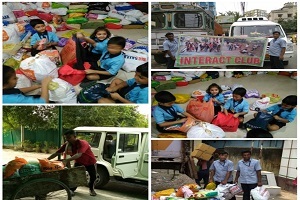 The Interact Club of DPS Megacity is actively involved in various sustainable social service activities. Efforts are to sensitize our students to needs of people all around. Often our students visit schools for underprivileged students to help them out. DPS Megacity donated 5 wheelchairs for physically handicapped. Teachers and Interact Club members together contributed rupees forty thousand towards college education of five college students. “When we give cheerfully and receive gratefully, the world is blessed.” in the immortal words of Maya Angelou the resonation of grandiloquence shines through. Delhi Public School Megacity in Kolkata saw the former part of Maya Angelou’s excerpt prove true as they decided to stand in unison with the victims of the Uttarakhand tragedy. Over the past couple of moths Uttarakhand has seen and experienced despair which is unprecedented. Agony and anguish transpired with approximately 5,748 missing people’s cases out of which 1,200 were innocent children. The unanimous response Delhi Public School Megacity received after an earnest plea from the revered Principal of the institution, Mrs. Indrani Sanyal to contribute to the Chief Minister’s Relief Fund and Prime Minister’s Relief Fund and aid the ones who were affected by all of the pandemonium paved the way for a response which remains unparalleled. Segregating a part of their salaries, the teachers led the way by contributing as much as they could. Taking a cue from the teachers, parents and students alike joined in by putting forth a sign of goodwill with monetary aid. Amassing a figure of Rs. 4,00,000 which was sent to the PM’s and CM’s relief funds, the school hopes that the ones victimised will receive the just amount of assistance. Even though it is not how much we give but how much love we put into it, here is to hoping that the efforts will go a long way in giving the plaintiffs of the Uttarakhand disaster their lives back. After all, we fall only to rise again. Over a hundred students, parents, teachers as well as Rotarians stepped towards their commitments on Gandhi Jayanti (October 2, 2013) to witness one of the most moving and illuminative events of the year. “Talent Utsav 2013” sponsored by the District 3291 Interact Council, was an event which showcased the talents of the underprivileged society. 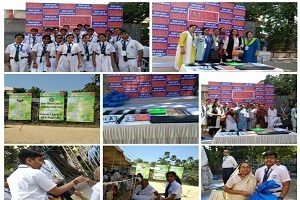 The event with a slogan of “Move for a Cause” held a competition between the leading night schools of Kolkata such as Suryakiran, Disha, Lotus, Ekta and Bal Vikas Kendra. All the contestants were awarded with participation certificates, gifts and food packets. After a short refreshment break, students from various schools such as DPS Megacity, St. James, and Chowringhee High, performed for the children of the night schools. The interactors of DPS Megacity collected old clothes, shoes and books from the students and donated it to the Siddharth United Social Welfare Mission on 8th October, 2013. On Monday, 28th October, the members of Interact club of Delhi Public School Megacity visited the Bachpan homes for the girl child. The students distributed food packets, books, and toys to them. They also tried to spread awareness on hygiene as well as environmental issues through short simple messages. On 29th October, 2013, interactors from various schools all over Kolkata witnessed one of the most motivational speakers with a genius vision, to inspire people all around the world to get over their adversities and insecurities, in a programme organized by Rotary International. Sam Cawthorn, the author of “Bounce Forward”, suffered from an accident in 2006 which nearly cost him his life, his right arm and crushed his right leg, when he had a crash collision with a truck at 205 kilometres per hour. But did this event in his life, stop him from becoming one of the most influential Australians of the 21st century? Not at all. He spoke about of being successful in life by explaining the difference between weak wishes and strong desires, and the importance of working hard and grabbing every single opportunity you get. According to him, a positive attitude and a smiling face could influence people to take better decisions and stay happier in life. He felt that as long as he knew he had changed someone’s life for the better, he could put his head on his pillow, feeling proud of his accomplishments. His wife and children were his life support throughout his struggles and hard times. He recalls the shocked expressions of one of his doctors, when he told him that he would never be able to walk again and a few months later he walked into his office. He used this episode to show that no matter what people think about you, you can always prove them wrong. At the end of the day, everyone went home, with a greater zest for life, feeling inspired and “blessed”! On 30th October, 2013, the DPS Megacity Interact Club interacted with the destitute old women, whom they fondly called grannies, and distributed gifts. They spent a whole day with them talking to them sharing their thoughts with them. The entire DPS Megacity family come together to donate items for health and hygiene . The interactors took a week long time to collect things , sort and pack them into different gift packs .Each packet was packed with articles of daily use and required to maintain basic hygiene like toothpaste,toothbrush,detergent soap, hand towel,bathing soap,cream etc and distributed among different schools for underprivileged children all across the city. Also things of basic hygiene were distributed to housekeeping staff of DPS megacity. On national reading day, 29th November, 2013, the Interact Club of DPS Megacity held a book drive and donated one hundred books to the less privileged children of the society. In its honor each student read a book to support the one nation reading together movement. Delhi Public School Megacity held its Annual Sports Day on 7th December, 2013 in the midst of hundreds of students and teachers. The DPS Megacity interact club hosted “Walk for Life, Care for Life”, where the Interactors marched hand in hand with the children of an orphanage to encourage brotherhood and unity as an integral part of society. It symbolized our fellowship with people from all walks of life. Each pupil held a poster which incorporated a special message on issues like world peace, health and hygiene and global warming for the community at large to follow. Few events were held specially for the underprivileged children. The winners were facilitated at the victory stand and were awarded medals by the District Interact Chairperson Prabha Binani, our respected Principal Indrani Sanyal Mam, and our respected Pro Vice-Chairman Sir Vijay Agarwal. They were also given food packets and gifts. 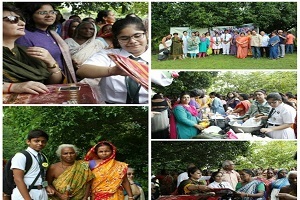 The Interact club members had put up two stalls, one for food another for handicrafts. The collections from the stalls will be used for the cause of underprivileged.